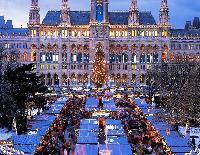 The first Christmas markets ever were held in Vienna. Where else should we start out other than in the country which is considered the place where the Christmas markets were born. Numerous Christmas markets take place in Munich between the 1st advent and the Christmas Eve, but the most famous one is the Christmas market at the Marienplat where you ll find all manner of stalls selling crafts, sweets, cakes, food, mulled wine and other delights. When in Germany, you shouldn t miss out the Nuremberg Christmas markets. Held annually in the Hauptmarkt, the central square in Nuremberg s old town, these markets rank among the largest and most famous in the world, attracting over 2 million visitors every year. On the Friday preceding the first Sunday in Advent, the markets are always opened with a prologue recited by the Christkind. The city of Cologne offers several Christmas markets with the most famous and popular ones located at the iconic Cologne Cathedral. Dominated by the giant cathedral, the markets include hundreds of festively designed wooden pavilions where you can watch artisans at work, enjoy Christmas mulled wine, or you can choose from an unlimited choice of sweets and local delicacies. The spectacular background makes this place a major Christmas destination attracting almost 2 million visitors annually. Located at the foot of the Hohensalzburg fortress and around the venerable Cathedral of Salzburg, the Salzburg Christmas markets are more intimate affair than some of the larger city s markets but the magic-like atmosphere and the smell of punch and toasted almonds, hot roasted chestnuts and freshly baked apples will make you love this place. As the birthplace of Mozart, Salzburg has an outstanding musical tradition and the markets also offer wonderful choral performances. Held in the two most famous Prague squares the Old Town Square and the Wenceslas Square, the Prague Christmas markets consist of brightly decorated wooden huts selling traditional handicrafts such as glassware, jewelry, wooden toys, metal-ware, ceramics, scented candles, Christmas tree ornaments, clothes, puppets and many other. Traditional Czech dishes and drinks are available as well. The markets also feature a giant Christmas tree and an amazing living Bethlehem. Another popular Czech Christmas markets can be found in Brno, the second largest city of the country. Located in the main city square, the markets offer wide range of decorations, gifts, souvenirs, and traditional handcrafted products. While enjoying the peaceful Christmas spirit, you can also listen to traditional Christmas carolers, and watch performances put on by musicians, dancers, and artists. The Brno Christmas Markets open on November 30th and close on December 24th. There are not that many Christmas markets in Poland but the major ones such as those in Warsaw, Gdansk or Wroclaw are famous all over the country. Beginning on Swidnicka Street and running through the market place to the old city, the Wroclaw Christmas markets are a must-visit for all food lovers since they offer a plethora of not delicacies such as Hungarian kalachs, French creme brulee, Lithuanian cured meats or Austrian and Italian cheeses this is just a small example of what you can come across at the Christmas markets in Wroclaw. If you want to visit the oldest and most famous Christmas markets of France, you don t go to Paris but rather go to Strasbourg. 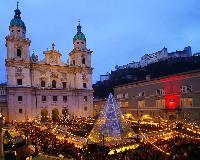 Founded in 1570, Christmas markets in this city provide a spectacular combination of lights and smells. Apart from traditional Christmas market products such as mulled wine, spice bread, bretzels or pastries, the Strasbourg markets also offer a local specialty spicy hot orange juice.